My regular readers probably already know this, but I am a huge fan of Sony. So it’s no surprise that I am super excited about the new Sony XAV-AX200. 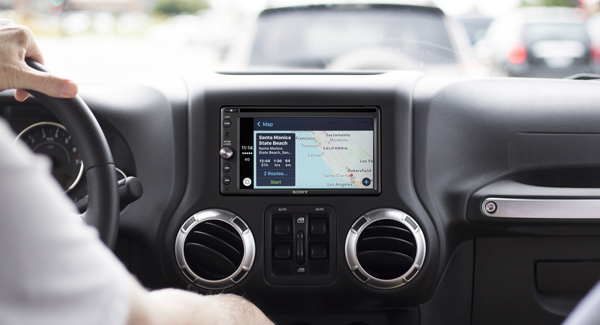 Like the current XAV-AX100, the XAV-AX200 is both Apple CarPlay and Android Auto compatible. 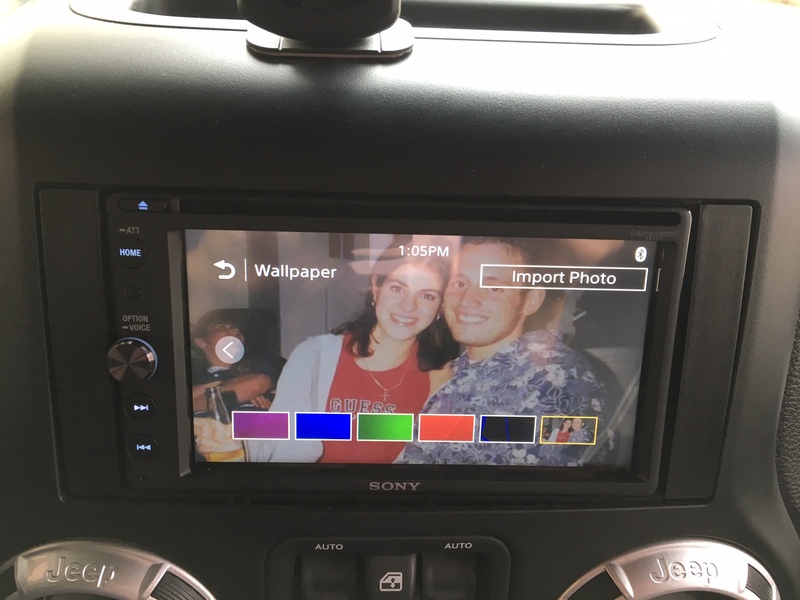 I already have the XAV-AX100 in my Jeep Wrangler and have been loving it. It’s easy to use, sounds great and has a very clean, minimalistic appearance – yet it still has a volume knob – which I totally love and use all the time even though I have steering wheel controls. Despite that, as soon we receive these at our shop, I will be upgrading to the XAV-AX200. 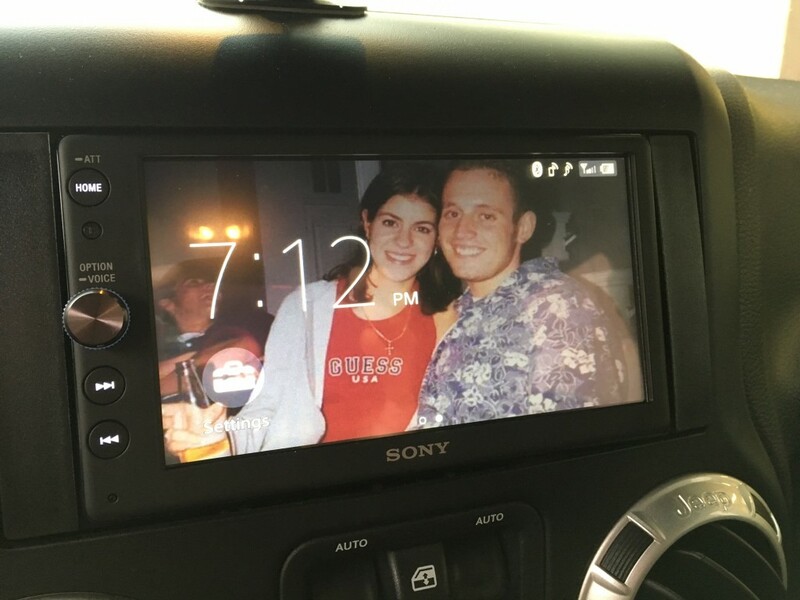 My Sony XAV-AX100 in my Jeep Wrangler displaying the two people I love and miss most. At the showroom in our shop, most of our customers naturally gravitate toward the Sony XAV-AX100. They like the clean look and they really like the volume knob. However, there are a few key features missing that are certainly deal breakers for some of my customers. This inevitably leads me to steer them away from Sony over to a Kenwood, Alpine or a Pioneer. The Sony XAV-AX200 addresses these deal breaker features and I gotta say, they’re being really clever about it from a marketing standpoint. When the XAV-AX100 first came out, it sold for $499.95 and we sold quite a few at that price. At the time, that was the entry level price for a head unit that was both Apple CarPlay and Android Auto compatible. Not too long after it came out, Sony got a bit more aggressive and put it on sale to $449.95 and then $399.95. Finally they just decided to keep it at that new lower price. With an expected retail price of $499.95, the Sony XAV-AX200 has a lot more features for only $100 more. Features that will steal market share away from Kenwood, Alpine and Pioneer. Let’s review. Higher Voltage Pre-amp Outputs – Sony’s website says the new XAV-AX200 has a 4 volt pre-amp. I wanted to check the owner’s guide to confirm that, but it’s not on their website yet. Usually Sony has 5 volt on their premium models, I’d be surprised if it was only 4 volt. CD/DVD Player – Yes, believe it or not, there are quite a few consumers out there not willing to let go yet and now they don’t have to. SiriusXM Compatibility – You all know how I feel about SiriusXM, but I get it, some of you have it have it. Not only is this unit SiriusXM compatible, it even comes with a free SXV300 tuner. Mass Storage Device Control for Audio and Video – The XAV-AX100 USB could only read software updates and upload a background photo image from mass storage devices (despite it also being compatible with Apple CarPlay and Android Auto – that always seemed odd to me how they limited this).The Sony XAV-AX200 supports audio codecs like PCM, MP3, WMA, AAC and FLAC from mass storage devices. It also supports video codecs like MPEG4-SP/AVC (H.264 Baseline), WMV, FLV and MKV/XviD. 3 Camera Inputs - Although the XAV-AX100 has a reverse camera input, some of us like to have a front camera, blind spot cameras or even rock crawling cameras. Sony makes it easy to add those additional cameras and select which input you want to view directly on screen. Tom Tom GPS Navigation Compatible – if you feel more comfortable with a dedicated GPS receiver, rather than relying on your cell phone, you can add the Sony XA-NV200 navigation module with GPS antenna. It appears that once again, Sony is nailing it when it comes to features, sound quality and value. I expect to sell a lot more Sony once the XAV-AX200 arrives and I expect my Jeep Wrangler to look more like the one below very soon. How is this unit working out for you? Still debating. The alpine unit is nice but a frikin fortune. Looking to connect my IPOD, Note 8 and XM.. Wait for the soon-to-be-released Sony XAV-AX5000. Capacitive display, bigger 6.95″ screen, and dual USB, for a RRP of $430 – this is basically all you’ll need. Neat, but no volume knob Kind of a cool update, I think coming summer time, the XAV-AX200 will eventually be revised to be iDatalink Maestro compatible. That will make this unit a lot nicer I think. As it sits currently, it’s difficult to program the phone functions in most cars because of the way Sony lumps functions together in their steering wheel control output. Have only had luck using the ADS-MSW or ADS-MRR. The XAV-AX100 can play audio, videos and photos and is even capable of browsing the folders on the usb key. It also support, without telling it in the manual, using a USB hub to connect android auto AND an usb media filled key at the same time. Thanks for the tip! I have not tried that, tried an iPod and a USB drive with some FLAC files on it and got no response other than USB not supported. Upon further inspection the manual states it is compatible with: WMA, MP3, AAC, FLAC, WAV, Xvid MPEG-4 WMV and FLV! I probably had an incompatible sample rate. Hey, Thanks for a great review. So i’m trying to decide between the AX100 and AX200 and the only difference I care about is the 4V vs 2V pre-outs (don’t need DVD, camera, XM, features). How much of a real difference do you notice between the two units? I know you mentioned in your AX100 review that the 2V outs seem to sound stronger than advertised. If this were the only thing you cared about is the upgrade worth it? It will be feeding a Alpine PDX-5 over a 10 foot cable run. Thanks! I really did not notice a difference honestly which I thought was odd because normally, there’s a pretty big audible difference between a 2 volt pre-amp and a 4 volt pre-amp. I’m sure if we took an oscilloscope and measured both pre-amps we’d see some kind of difference, but I don’t think it would be much. Both sounded great in my Jeep with Alpine’s PDXV9 5 channel amp. Annie – Any thoughts on the new XAV-AX5000? Looking at either the XAV-AX5000 or the XAV-AX200. There are some obvious differences – notably the larger capacitative screen. I like the three video inputs of the XAV-AX200 and its rotary control. Any thoughts on the comparison? I prefer the volume knob of the XAV-AX200 personally. Hey Daniel, I just realized the XAV-AX5000 is mechless so if you want a CD player go for the XAV-AX200. Hi Annie, I’ve been using the XAV—AX200 for a couple months now. I installed it in my Wrangler using a Metra kit and the fit was less than stellar. I just attempted to reinstall it with the Best/PAC kit that you recommended. I’m having the same issue. Have you installed a 200 yet? The front of the Sony has a rounded corner face that doesn’t seem to protrude out enough to clear the Wrangler dash panel, leaving it recessed too much for my taste. It definitely doesn’t look like the 100 in the picture of your Wrangler. Do I need to trim the radios bezel? Or the dash panel? Thanks for your help. As a fellow Wrangler owner, I figure you know the tricks to a clean install. Looks like a pretty solid stereo. I’ld likely pick this over Pioneer’s AVIC 8201-NEX , Still trying to save money. Does this unit work with steering wheel controls? Yes – but like the XAV-AX100 it’s quirky in that some functions are lumped together. For example “Source” is also “Hang up” or “Reject Call”. Works best with iDatalink ADS-MSW or ADS-MRR. Eventually there will be a hardware change in production and these will be full iDatalink Maestro compatible and will include vehicle info, car sources (assuming you have a vehicle that is iDatalink Maestro RR compatible). First of all, thanks for putting the note on your AX100 entry about the new AX200! I had no idea it was coming — timing worked out perfectly (and I’m beyond stoked for the 3 camera inputs). I installed it in my ’10 JKUR (which has the factory Infinity setup). Used a CRUX SOOCR-26 wiring harness (my JK steering doesn’t have any radio buttons on it). I knew the CRUX wouldn’t have any front/back fade capability, but since I never messed with that on the stock radio, I didn’t think I’d need it. Just my luck, everything on the AX200 sounds faded towards the front — except for AM radio. AM radio sounds faded perfectly (just like the stock radio), but CarPlay and FM radio are faded to the front. Definitely getting sound out of the roll bar speakers, just way more out of the front ones. I saw another review mentioning the same behavior, so I’m not sure if this is a side-effect of the CRUX (and I’d have better luck replacing it with a Maestro), or if there’s something else I could check. Was curious if you had run into anything like this in your experiences. I have not run into any issues with that Crux piece, we do sell quite a few here for Jeeps and Chryslers like yours without steering wheel controls. In general I find the Jeeps have a very front focused sound stage due to speaker placement, especially with the upright tweeters like you have (which I like, one of the Alpine tech’s designed the speaker layout in the JK’s). I don’t really listen to FM or AM so I’d have to try it and see if I notice any difference. Metra has an interface that does allow for fader control, the CHTO-03 so you may want to try that. The Maestro is probably more than you really need, but in the software I believe there are adjustments for things like amp gain so that is nice. Sorry I couldn’t be more helpful with this one. 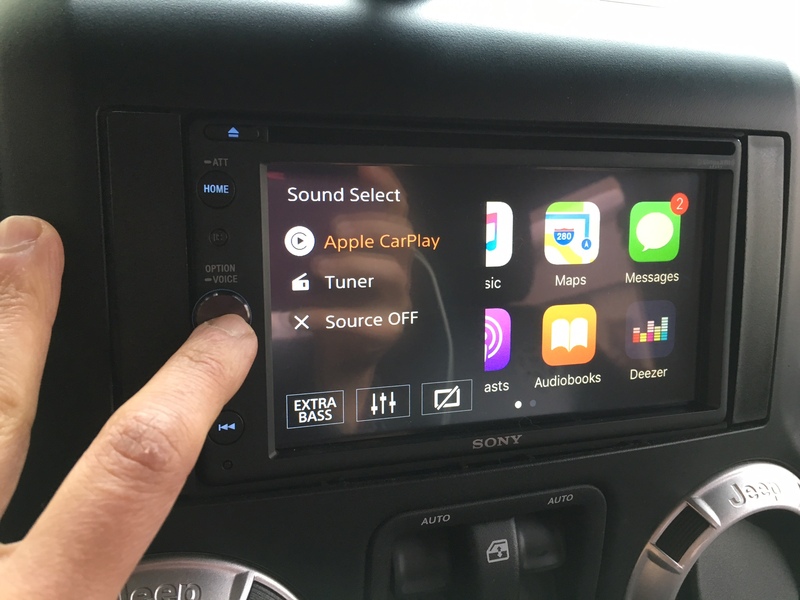 my big concerns for the unit are is it capacitive touch or does it keep the terrible ressistive touch of the ax 100 also does it have HD radio because thats a huge miss of the ax 100 as well. im also not a fan of its built in sub controls does the ax200 have better control over the subwoofer ? Hi Christopher – touch screen is exactly the same, but I’m surprised to hear you had issues with the XAV-AX100. I found it to be spot on (more responsive than the Kenwood DMX7704s I just put in there after trying out the XAV-AX200 for a week-I still need to write the review or a Pioneer resistive touch screen for example). Sublevel shortcut is the same – tap the volume knob, tap the EQ lines to get to that screen (See photo). In general I always prefer a dedicated bass knob regardless of head unit, so much easier. 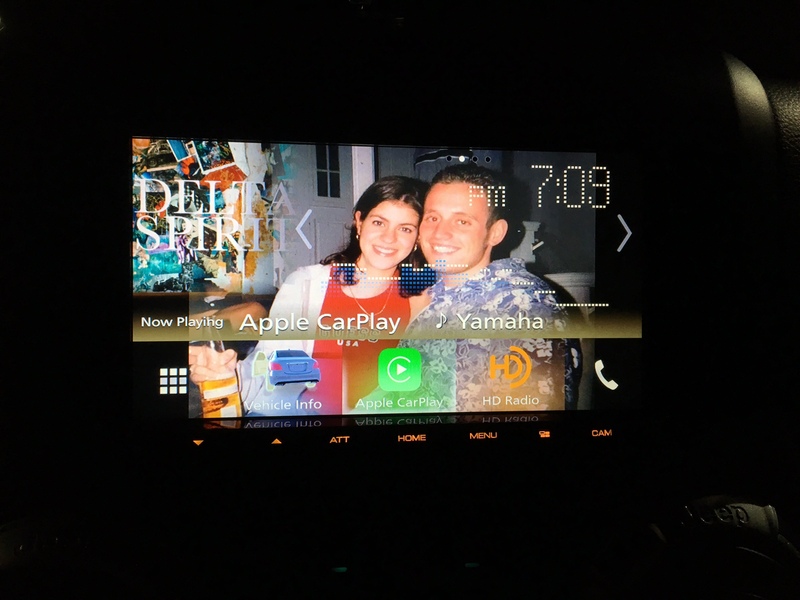 Sounds like you might prefer the Kenwood DDX9904s which has a glass capacitive screen and HD radio. But you gotta be careful, depending on the car and where the stereo sits and at what angle, sometimes glare is an issue with these glass screens. Think about how hard it is to look at something on your phone sometimes in bright sun with glare, same idea. The home screen is also a bit busy for me on the Kenwood units (that’s the DMX7704s pictured, but same homescreen layout). I find the look of the Sony was cleaner and I really liked the volume knob, but the sound quality of the Kenwood is slightly better. Also noticed the background image more vibrant and not subdued the way Sony does it. That’s weird, what kind of car? Haven’t had to do that for any installs I can recall. It’s a standard double din sized radio. Unless you installed it in a car that was din and 1/2 maybe? Then yeah, you’d have to shave it down, but again depending on year, make and model there is most likely a nice install kit available to flush it out nicely. Question. Will this unit have a video out?? Follow up. I have an 07 Grand Cherokee with VES screen in back seat. If AX200 has video out will I be able to connect to VES screen? Great question – I opened up the install guide to check and it does have a video output! I just got them in today and hadn’t even had a chance to open one up yet. So we’ve got Front, Rear and Subwoofer RCA preouts (sub is mono so you need a y adapter), one video output, but it’s only video – no audio – so it’s not like it has dual zone, you’ll have to listen to whatever DVD you want to feed video out for and there’s no aux input so you couldn’t feed the rear DVD audio/video back up front. Other than that you’ve got the 3 camera inputs, steering wheel control input, mic, USB and optional external GPS input (for their Tom Tom GPS add-on unit). Does your rear seat screen have a video input? As long as it has an AV input you need to route a video cable out from the Sony into that. The Pac Audio RP4-CH11 lists that it retains RSE and then list the CHYRVD to retain VES, but that adapter is really only to work in something with an audio/video in and an audio/video out like an AVH-4200NEX for example. Thanks Annie. I ended up ordering the PAC RP4-CH11 and the CHYRVD after speaking with their support. They assured me that I would push video out to the back screen with their product however I am still skeptical. The VES unit does have video and audio in on the dvd player in the back but like you say, it is useless with this Sony unit. Super frustrating but resigned to the fact that at min I can push video to back screen (potentially) with RP4 ect. Frustrating that this unit does not have more in’s and out’s! I do wish I could find a dash kit for the Wrangler that looks like Sony’s marketing shot—without the filler pieces of the Metra kit. Have you done a review of the nav module? I can find very little hands-on info about it. Yeah, my husband eventually ended up making a kit like that for his Jeep. Since we cut a lot of dashes for the oversized Alpine head units, he kept the leftover part and filled it in and painted it making a perfectly flush kit like that. The Best Kits BKCDK642 is flatter and more flush I think than the Metra which sort of has beveled edges (I have the Best Kits one in the pictures shown with the XAV-AX100). FYI SiriusXM is super compressed like between 32-48 kbps so either way you may still notice the drop in output/fullness from SiriusXM compared to music say downloaded from iTunes in apple lossless. Bluetooth output level should not be an issue. 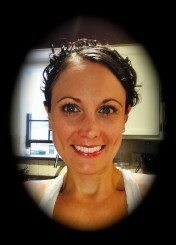 You may appreciate my article on SiriusXM, not sure if you’ve read that one yet. I have not used this particular nav module from Sony yet, I tried their last one with an XAV-712HD which also used Tom Tom mapping and it was okay, got the job done, but the graphics and user interface seemed a bit dated. The graphics on this one look a lot nicer, but I have not had a chance to get a hands on look at it yet. I mostly agree with you about SiriusXM. In addition to the quality issue, and subscription costs (for 2 vehicles), the rotation is simply shallow. The main upside to it is for road trips, but sometimes that just puts a spotlight on the repetitiveness of most channels. My subscription expires on 10/22 and I’ve decided not to renew—but it is nice to have the option in the future with the new Sony. If you end up with a review unit of the new Sony nav module, I’d be interested in your opinion. Live maps on Waze (but not CarPlay compatible) and Apple Maps willl be great, but some road trips will require offline data for the remote areas. any idea when this new model will be available? Last I checked I heard later this month. Abt is claiming that they’re getting them in stock today. I ordered because the site says they’re in stock, order showed them as back ordered. Called and they said they’ll be shipping today or tomorrow. Cool! Thanks for the tip Mike. Abt shipped mine last night. Best Buy is showing as available next week. I haven’t seen them available anywhere else so far.